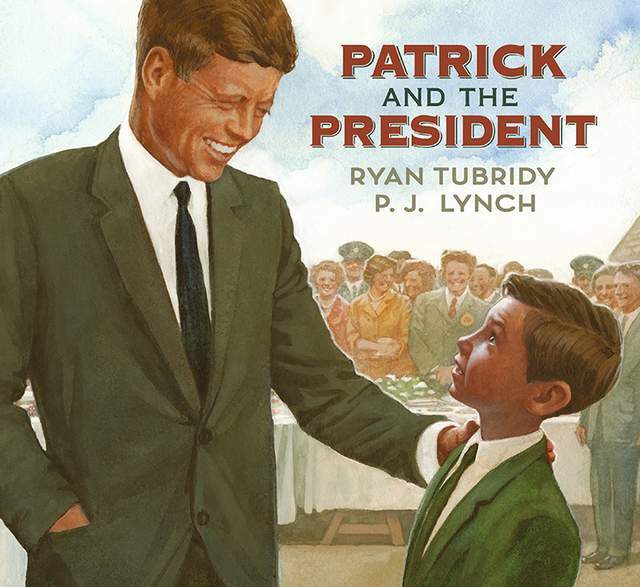 Patrick and the President is a heartfelt and beautiful picture book about John F. Kennedy’s 1963 return to his ancestral home. This lovely book was written by Ryan Tubridy, one of Ireland’s most beloved media personalities, and illustrated by P.J. Lynch, a prolific Irish artist and picture book illustrator. A copy of this delightful children’s book has been provided by the publishers Candlewick Press, for one lucky reader to win. The details on how to enter the giveaway are at the end of this post, but first let me share how this book commemorates this important piece of Irish American history. Witnessed through the eyes of a young Irish boy, this captivating story beautifully evokes John F. Kennedy’s return to his ancestral home. When the beloved president visited Ireland in 1963, he described it as the best four days of his life. And for a generation of Irish people, it was a trip they never forgot. This warmly told, bighearted picture book captures the fevered excitement in the buildup to the president’s visit, seen through the eyes of a young boy named Patrick who wants to know more than anything what it would feel like to shake the president’s hand. Rooted in historical fact and marking the centennial of John F. Kennedy’s birth, this feast of a book offers readers a pure and personal take on JFK’s visit to County Wexford, Ireland. Included in the back matter is a time line that helps amplify the story. A sneak peak inside Patrick and the President. John F. Kennedy always had close personal ties to Ireland. 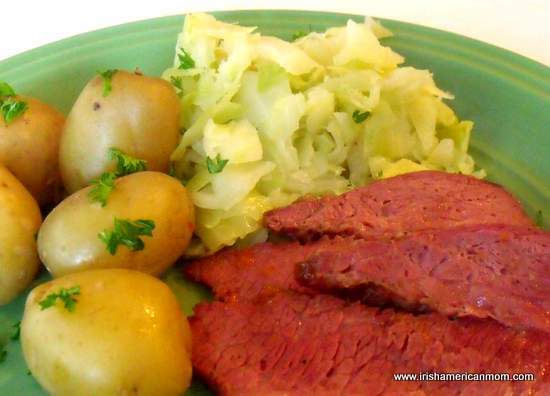 In the late 1840s, during the devastating potato famine, all eight of his great-grandparents left Ireland and immigrated to Boston, Massachusetts, where several family members became successful politicians. JFK treasured his Irish heritage, and after his presidential inauguration, he was determined to return to his ancestral home and walk in the footsteps of his forebears. In April 1963, it was announced in Ireland that the American president was coming to visit. His trip was planned with military precision, and at every stop along his four-day trip, tens of thousands of people flocked to catch a glimpse of him. For a whole generation of Irish people, JFK’s visit to Ireland became a momentous and unforgettable occasion in their lives. Ryan Tubridy is one of Ireland’s leading and best-loved media personalities, gracing both the Irish and U.K. airwaves, and he has won numerous awards and accolades. He is best recognized as the current host of the long-running chat show The Late Late Show and is also the author of a nonfiction book for adult readers, JFK in Ireland: Four Days that Changed a President. Ryan Tubridy lives in Dublin. P.J. Lynch has won the Kate Greenaway Medal twice and the Christopher Medal three times. His research brings impeccable detail to the twenty books he has illustrated, including The Christmas Miracle of Jonathan Toomey by Susan Wojciechowski, When Jessie Came Across the Sea by Amy Hest, A Christmas Carol by Charles Dickens, and Mysterious Traveler by Mal Peet and Elspeth Graham, as well as his author-illustrator debut, The Boy Who Fell Off the Mayflower, or John Howland’s Good Fortune. P.J. Lynch is the current Laureate na nÓg, Ireland’s laureate for children’s literature. He lives in Dublin. One lucky winner will win a copy of Patrick and the President. To enter just leave a comment on this blog post by noon on Saturday, March 11th, 2017. Any comment will do. What you write does not affect your chance of winning, but if you need inspiration why not tell us if you have any memories of JFK. The winner will be announced on Saturday, March 11th 2017, at the bottom of this blog post. A big thank you to Candlewick Press for sharing this wonderful children’s book with us today. I am delighted to help commemorate the 100th anniversary of John F. Kennedy’s birth by sharing this book. And a big shout out to all who take the time to leave a comment to enter this little giveaway. As always, your support is greatly appreciated. Thanks to everyone who joined in and entered this little giveaway. And a big thank you to Candlewick Press for sponsoring this prize. Wishing everyone a very happy St. Patrick’s Day. PATRICK AND THE PRESIDENT. Copyright © 2017 by P. J. Lynch. Reproduced by permission of the publisher, Candlewick Press, Somerville, MA on behalf of Walker Books, London. Captain Cillian is a friendly sailor from Ireland, who loves to explore the oceans with his mates. Today, I’m delighted to introduce you to this fun and educational Irish seafaring character for children. And good news! There’s a fun kid’s adventure pack giveaway at the end of today’s post. But first, let’s learn a little bit more about this friendly Irish sailor. Let’s start by learning how to say our friendly captain’s wonderful Irish name, Captain Cillian. Sometimes you see this name spelled as Killian, but our good captain uses the Irish version of his name, Cillian, since there is no letter ‘K’ in the Irish language. 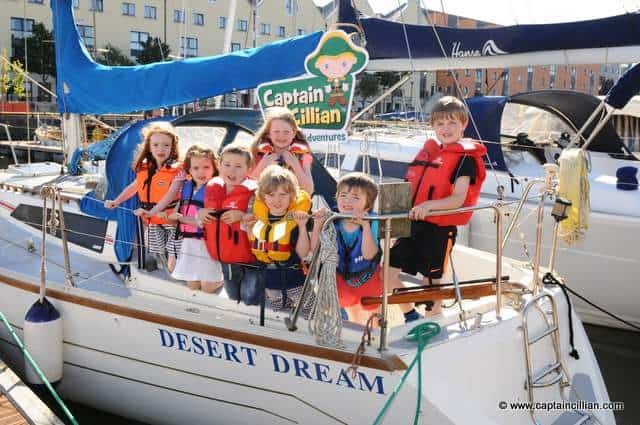 Captain Cillian loves exploring the seas and oceans around Ireland and the world. He currently has three Irish seafaring short stories featuring Captain Cillian and his friends. 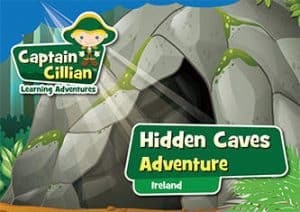 In Hidden Caves Adventure this cute little captain sets sail from Galway and heads south to County Clare in search of caves and hidden treasure. Together with his mermaid and pirate friends, Captain Cillian explores the Cliffs of Moher, and discovers a secret passageway. Deep in the caves they encounter trouble. Will they make it out alive? Will they find treasure, and who will save the day? 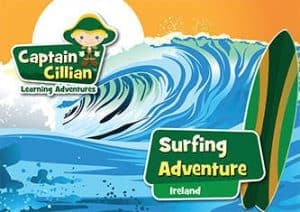 Captain Cillian braves the waves of the Atlantic Ocean once again when he sets sail from Dingle in County Kerry on his Stormy Sea Adventure. He sets out on a bright sunny morning, but you know Irish weather is never to be trusted. He soon encounters stormy seas and blustery winds and rains. Will he steer his ship away from dangerous waters? Will Dolphin Rian save the day? In the third book in the series, Captain Cillian takes us on his Surfing Adventure. He sets sail for the beautiful beach in Strandhill, County Sligo to visit his cousin Ciara (pronounced Keer-ah). They explore the beach and learn how to surf. Meeting new friends in the water, they learn all about the waves and surfing in this beautifully illustrated picture book and learning workbook for young children. These lovely Irish tales are perfect additions to story time for Irish or Irish American families who wish to take their children on a fun seafaring adventure around Ireland. So far, three stories have been released in the collection. But there are more to come. 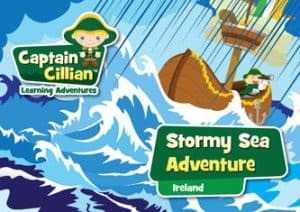 Soon Captain Cillian will launch his Wild Atlantic Way Adventure Pack. Captain Cillian is the brain child of a busy mother of two boys, who lives in Galway City in the West of Ireland. Inspired by the Wild Atlantic Way, which is right on her doorstep, Carina Ginty’s love of the sea is clearly evident in her books about this clever little Irish sailor. 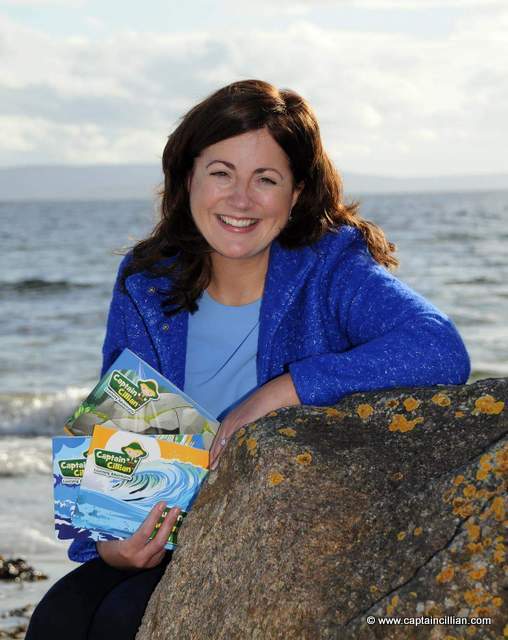 She has created amazing educational resources to put some fun into learning Irish, and exploring the beauty of Ireland’s coastline. You can learn more on Captain Cillian’s website, Facebook page, or on Twitter. I received a complimentary starter pack for review purposes and to help me create this blog post. It arrived packaged in a lovely shiny green envelope, sealed with Captain Cillian stickers. Always young at heart, I was excited to explore the contents of this adventure pack. Carina has gone the extra mile to create a truly appealing package, that will peak the interest of Captain Cillian fans, both young and old. This is a fun way to learn about Ireland and to be introduced to the Irish language. At the back of each book there is a learning chart for Irish words with phonetic pronunciations. One book covers colors, another numbers, and another items of clothing. Throughout each book there are highlighted “Learn Irish” boxes. The phonetic pronunciation for the Irish words is not included here. But for anyone wishing to start learning Irish, the lessons at the end of each book are a wonderful introduction. The books can be purchased separately or as part of an adventure pack on Captain Cillian’s website. And good news! There’s free worldwide shipping available on orders over €25. 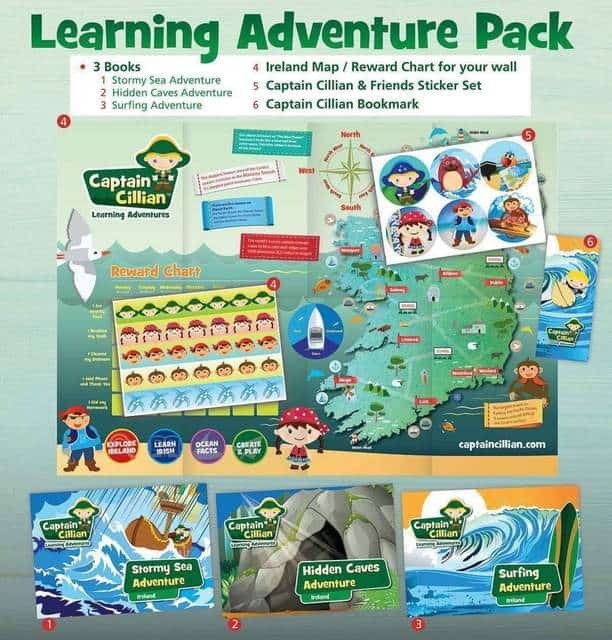 One lucky winner will receive a Captain Cillian Learning Adventure Pack. 3 short learning adventures exploring Ireland titled Stormy Sea, Hidden Caves and Surfing Fun. To enter just leave a comment on this blog post by noon on Sunday June 19th, 2016. Any comment will do. 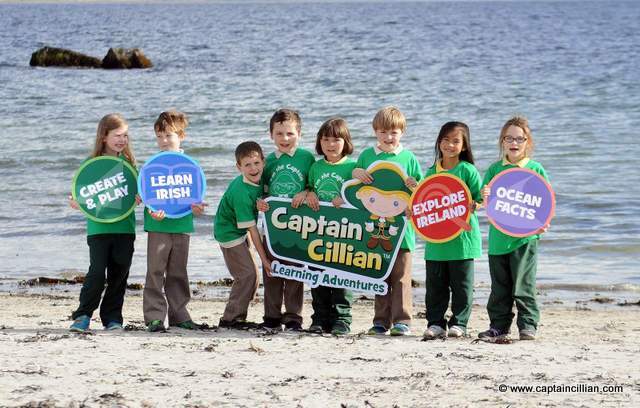 What you write does not affect your chance of winning, but if you need inspiration for your entry why not tell us where you would like to explore in Ireland with Captain Cillian and his friends. One winning comment will be chosen randomly. Remember to leave your e-mail so that I can contact you should you win. Your e-mail won’t be published, just used to contact our lucky contestant for mailing of the prize. The winner will be announced on Sunday June 19th, 2016, at the bottom of this blog post. Thanks to everyone who supports this little giveaway by leaving a comment. Please do share the news about this little Irish sailor with your friends and family. And a big thanks to Carina for introducing us to Captain Cillian and his friends. And a big thank you to Carina Ginty for sponsoring this prize and for introducing us to Captain Cillian. Wishing her every success with her unique business. Fairies, pixies and Celtic mythology meld together magically in the glorious childrens’ tales of The Fairly Stillwart Chronicles by Scott Butcher. Today I’m thrilled to introduce this Canadian-Australian author and his enchanting tales that traverse the globe from the southern hemisphere, through the Canada Place, to find illusory answers in the most mystical of all islands, the Emerald Isle. Morning Rain Publishing is sponsoring a giveaway, so don’t forget to enter for a chance to win at the end of this post. Stillwart was a pixie foundling. She was rescued as a young grain by Fionnabhair, the once great queen of the Southern Fairies. Fionnabhair, Fiona for short, was very old at the time – her eyesight was waning, so perhaps she didn’t realize that the little grain was dull and shriveled, not sparkly and vibrant like a fairy grain. Stillwart was something different. When she was born, she was ugly and brown, not glittery and golden. For a long time she was the only pixie in the Great Southland. But where had she come from? The Southern Fairies were descended from the last remnant of their kind. 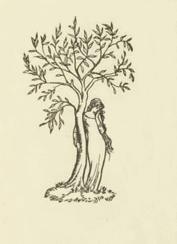 Fiona had been the only adult fairy to have survived when the humans cut down the white thorn tree more than two hundred years before. Fiona had come from Ireland in search of the last grains of her people, and her quest had led her to the far off southern shore of Australia. There she found the grain of her sister, Bell, and together they founded the Southern Fairies. So, the Southern Fairies were descended from Ireland, and Irish lore. But what of the pixie foundling, Stillwart? For many years she had no idea where she had come from, then, long after she had given up ever knowing, her Irish ancestry was revealed to her, and a new adventure began. 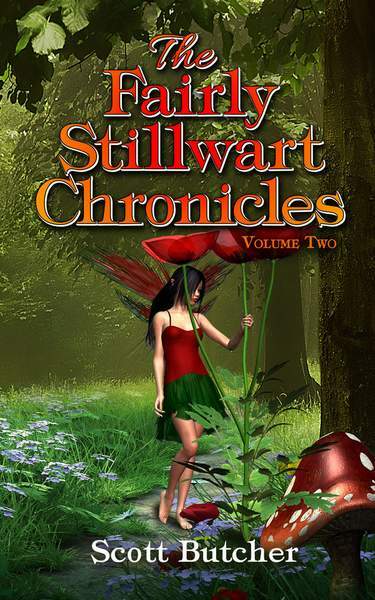 The Fairly Stillwart Chronicles are a series of six short stories detailing the life and adventures of Stillwart the Pixie and her adopted fairy family. 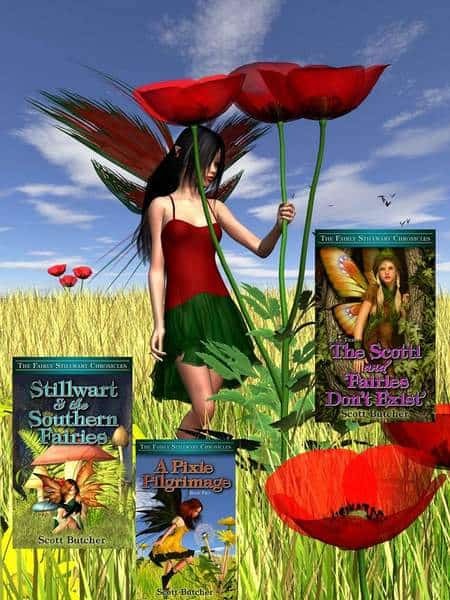 The stories capture the Southern Land Fairy folklore by bringing to life their world, hierarchy, and the challenges they face to keep their race and magic alive. The answer from yesterday’s Clue #3 is “Fairies Don’t Exist”. 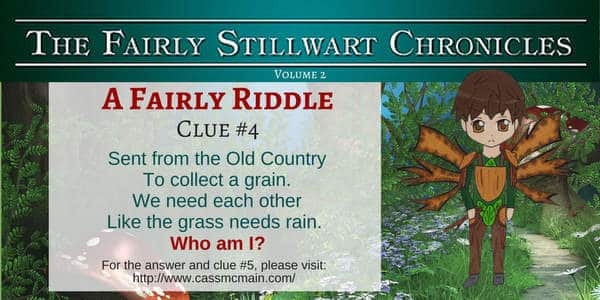 And for anyone searching for Clue #5 check out Cass McMain’s blog tomorrow. For me, an Irish descended author born in Australia to an Irish-Canadian mother, even though I was more than 150 years removed from Ireland, Stillwart always had to be Irish. My family on my mother’s side lived in the northern wilderness of Ontario and on the planes of Saskatchewan, but had remained a part of the Irish communities there. There is fairy lore from other countries, but I had always been interested in the Irish stories and in their origins from the Celtic tales of a strange semi-legendary people called the Tuatha Dé Danann, recorded in the Lebor Gabála Érenn or The Book of The Taking of Ireland. So, in The Fairly Stillwart Chronicles, you’ll see a strong Irish influence. Many of the fairy queens have Celtic names: Fionnabhair, Flóraidh, Etain, Eithne. The ancient lore of the white thorn tree is maintained and is given an important part in the chronicles, while other Celtic creatures, such as selkies and banshees, come to light. Celtic places in Wales and Cornwall also become part of the story. Tintagel, from where Uther Penn Dragon rode the dragon’s breath to sire his son King Arthur, as it turns out, is a sacred site to the pixies. My own name, Scott, was my mother’s maiden name and is a name descended from some of the earliest of arrivals in Ireland. 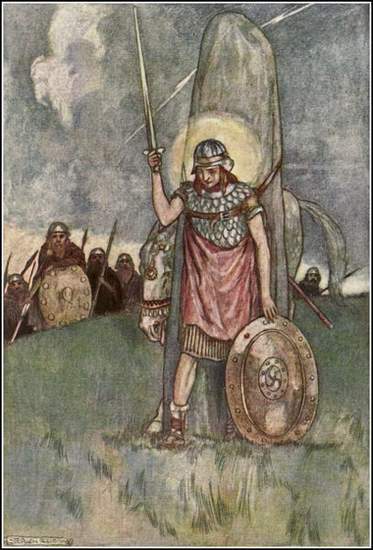 The Romans recognized the Scotti as a tribe of Irish sea pirates, while Scota was a mythical ancestress of the Gaels who took Ireland in an early Iron Age invasion. Here, in The Chronicles, the name is used again. The Celtic mythology’s of ‘fairy people’ would, at times, put a Grimm’s fairy tale to shame, but in The Fairly Stillwart Chronicles, the lighter, ‘child-friendly’ side of pixie tales is provided for middle grade readers. I’m sure they’ll enjoy them. A glimpse of future Pixie Tales by Scott Butcher. Simply fill out your e-mail or log in using Facebook on the Rafflecopter widget below to be entered into this giveaway. If you follow the Rafflecopter instructions you can earn some extra entries. Best of luck to all the entrants. 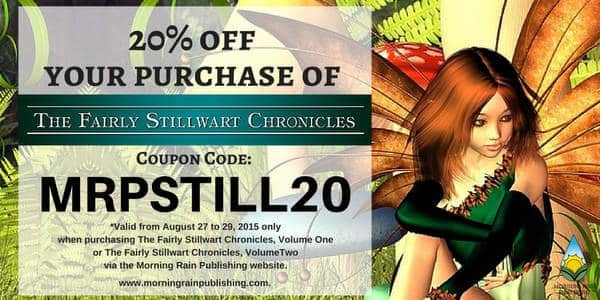 Morning Rain Publishing has provided a 20% discount code for orders of The Fairly Stillwart Chronicles placed on August 27th through 29th, 2015. I’m extremely grateful to Scott Butcher and Morning Rain Publishing for providing this wonderful guest post and images for me to share with you today. 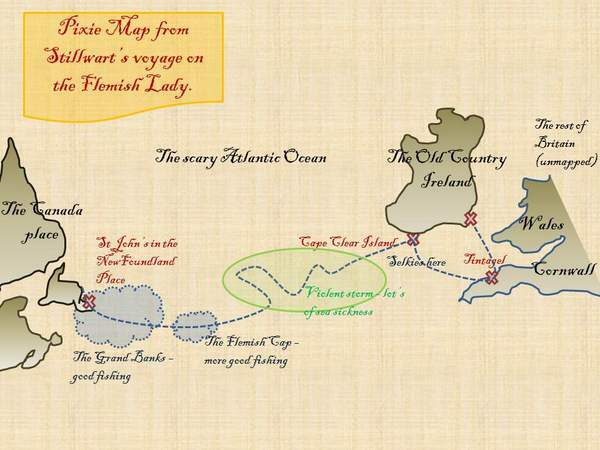 Those pixie drawings are simply fabulous, and that mystical map just stirred my imagination. Wishing them every success with this installment of these magical chronicles. Don’t forget to visit Cass McMain’s blog next on August 24th for the next blog tour stop. Ireland is a land of myth and legend, with epic tales from days gone by describing mysterious worlds, where nature and magic exist side by side. 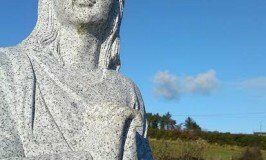 Irish children grow up hearing stories of brave warriors and fearless saints. 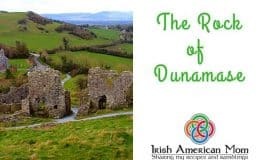 Today I’m delighted to publish a guest post by David Murphy, co-author and presenter of two new audio books, retelling Ireland’s ancient tales of enchantment. David and his brother Stephen have graciously sponsored a little giveaway for Irish American Mom’s readers. 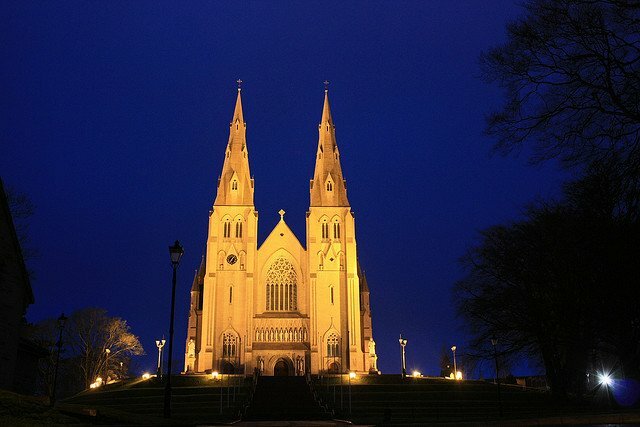 But first let’s head over to the brothers to hear about their Irish mystical realms and valiant heroes …. 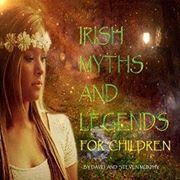 Award winning authors David and Steven Murphy bring you a two part audio book “Irish Myths and Legends for Children” and “Irish Myths and Legends Part II”. 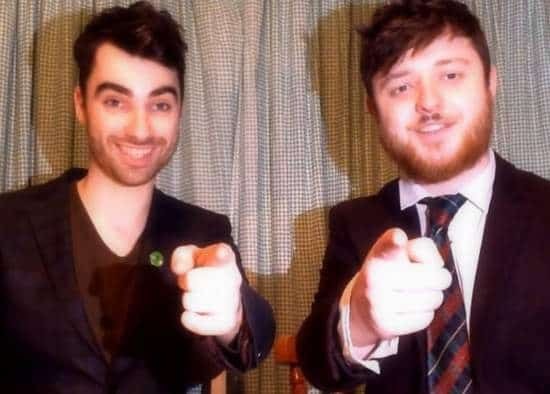 Born and raised on the mountainsides of Dublin, brothers Steven (Stiofán) and David (Daithí) want to pass on from generation to generation the magical myths and legends told by their grandparents. The brothers have invested a lot of time, and even more money, to record and produce these albums to the highest quality for you and your loved ones’ enjoyment. The 10 track albums are a compilation of the most fascinating tales from Irish culture, stories which really shape the beautiful land that is Ireland today. The Love Story of Cú Chulainn and Emer. And how could we forget such classics as …. 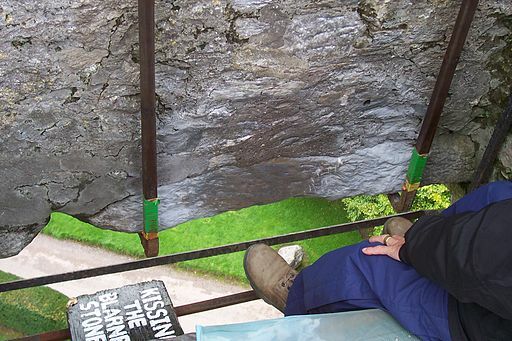 The Blarney Stone in County Cork – how did it end up at the top of a castle? …. as well as many many more, all found on these audio books. Both albums are available to buy in the digital music section of both iTunes and Amazon or from CDBaby. something other audio books don’t do. An audio book for all the family , that can be played on any phone, iPod or laptop, telling the most famous and intriguing tales of the mystical land that is Ireland …. An authentic “Made in Ireland” album. 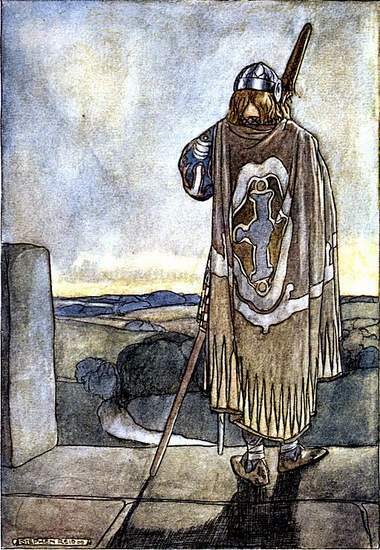 Illustration of Finn McCool by Stephen Reid, from “The High Deeds of Finn and other Bardic Romances of Ancient Ireland”, by T. W. Rolleston, 1910. The Murphy brothers have graciously sponsored a giveaway for Irish American Mom’s readers. In these audiobooks we hear of Ireland’s ancient heroes, including Finn McCool, whose dangerous adventures in defense of Ireland’s shores are retold galiantly. 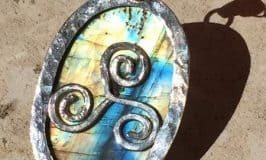 Ireland’s legends paint a picture of a land with a rich and colorful history, inhabited by wily druids, greedy kings, and a few wicked stepmothers. If you enjoy listening to the lilt of an Irish accent, then these stories are for you. Beautifully told they can be enjoyed by children and adults alike. To enter our giveaway just leave a comment on this blog post by noon eastern time on Wednesday, May 27th, 2015. You can leave any comment you wish. What you write does not affect your chances of winning. If you need some inspiration, why not tell us about your favorite Irish hero or heroine from days gone by. A winning comment will be chosen randomly. Remember to leave your e-mail so we can arrange to have your prize delivered. Your e-mail won’t be published or shared, just used to make contact. The winners will be announced on the evening of Wednesday, May 27th, 2015, and their names shared at the end of this post. 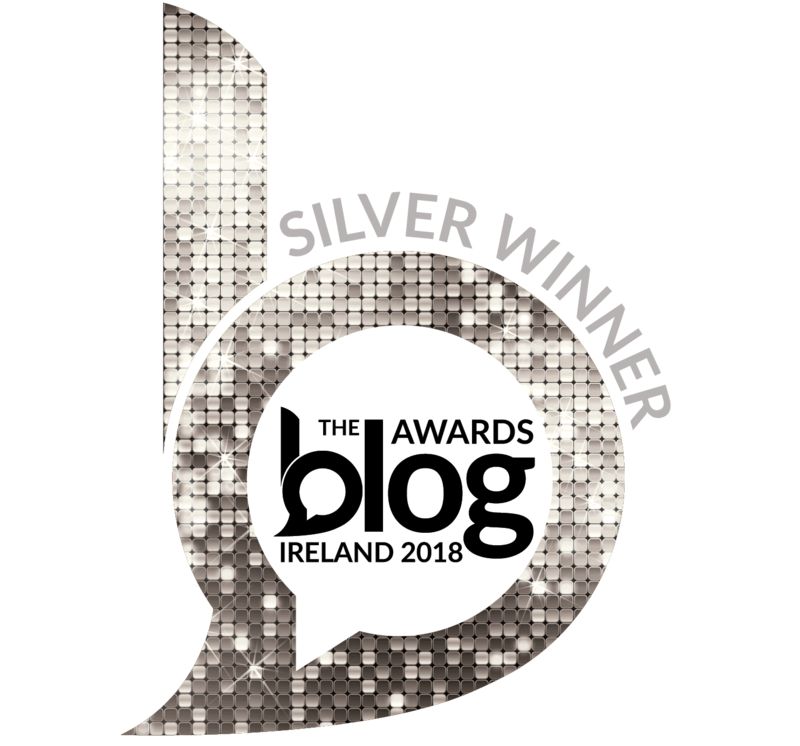 Best of luck to all our entrants and a big thank you to the Murphy brothers for sponsoring this great prize for Irish American Mom’s readers. I really appreciate their generosity. And a big thanks to all of you who enter and help spread the word to family and friends about this little giveaway. And a big thank you to the Murphy brothers for sponsoring this wonderful prize. Wishing them every success with this audiobook series. Disclosure: Irish American Mom does not have a business relationship with The Murphy Brothers. No cash payment was received for publishing this giveaway post, just a complimentary copy of their audiobook. I wish to thank David and Stephen Murphy for graciously sponsoring the prize for this audiobook giveaway. Today we’re stepping into a modern day Tír na nÓg (Land of Youth) with Éire’s Kids, a Galway based company that created the wonderful characters of Oisín the Brave and Princess Éire to spark the imaginations of young boys and girls. In today’s post, author Michelle Melville introduces us to the wonderful books she created with her husband Derek Mulveen. 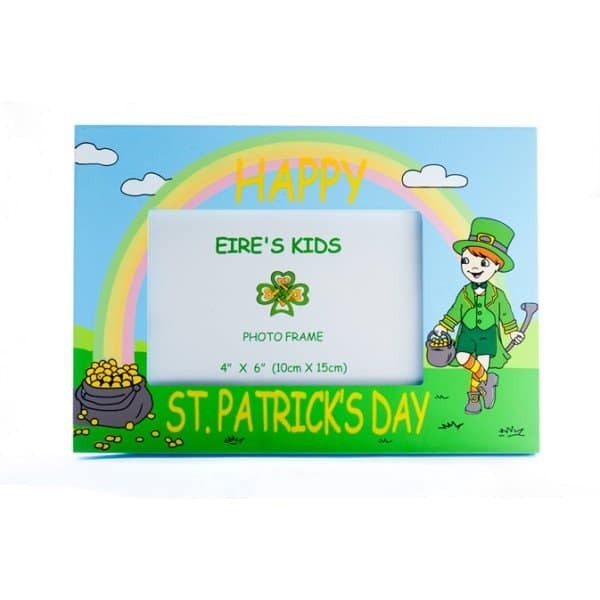 Their company, Éire’s Kids, create and sell gorgeous gifts and souvenirs for boys and girls from ages 3 to 10. For those living in Ireland or further afield, Éire’s Kids have something for all ages and interests. This entrepreneurial couple has graciously sponsored a giveaway for Irish American Mom’s readers. Check out how to enter our little giveaway to win one of 5 lovely prizes at the end of this post. But first let me hand you over to Michelle, to introduce you to Oisín the Brave and his wonderful friends….. 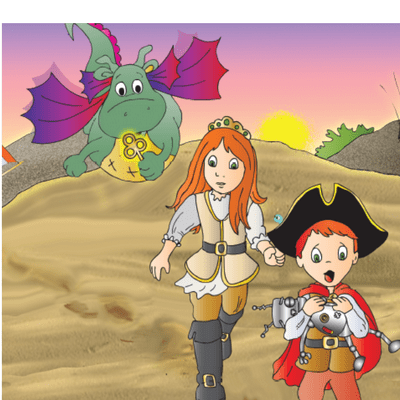 Follow Oisín the Brave and Orane the Dragon through the Dolmen of Time on an adventure that takes them traveling across many seas, meeting strange looking creatures and helping a little robot on a quest to find the GOLDEN KEY and save Robot Island …. 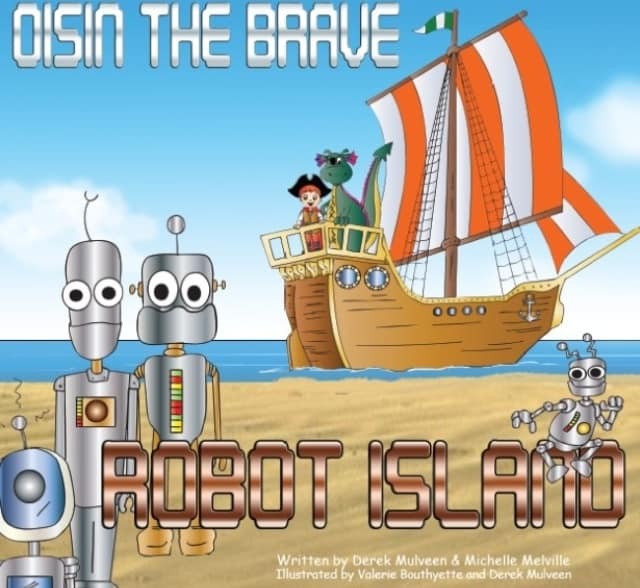 Oisín the Brave – Robot Island is written and illustrated by Galway couple Michelle Melville and Derek Mulveen. Their books and Irish themed gifts are designed to ignite the imagination of children with beautiful illustrations, colorful designs and exciting characters. Ireland’s recent economic downturn forced many Irish people abroad. Over the last few years, this married couple from Galway on Ireland’s west coast, watched loved ones move away. 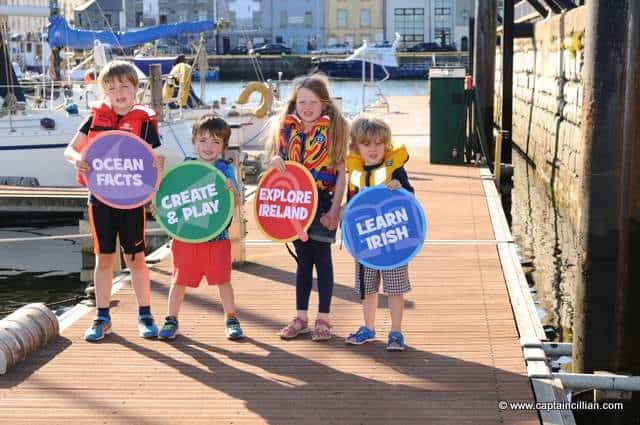 Determined to remain at home themselves, they created their own company — Eire’s Kids, a business that produces Irish-themed books, souvenirs gifts and keepsakes. 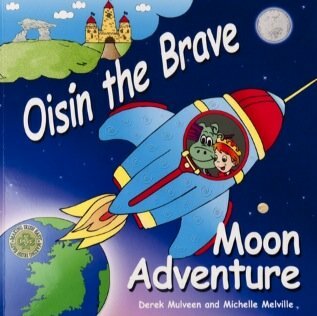 Their illustrated storybooks are based on the adventures of OISÍN the BRAVE, PRINCESS ÉIRE and ORANE the DRAGON. “Both Michelle and I worked in the construction industry and like many people, we found ourselves facing an uncertain future. At the same time, many of our friends and family had to travel abroad for work,” explained Derek. Our book series and products are designed to be bright, colorful and where possible, educational. 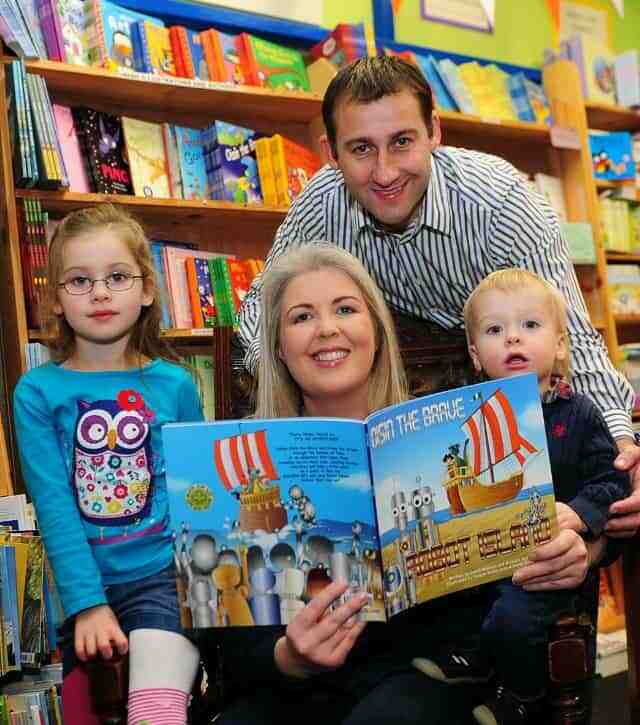 Derek and Michelle’s illustrated children’s books were very well received in Ireland and over in the U.S with recent book tours that saw Derek whimsically introduce Oisín the Brave, Princess Éire and Orane the Dragon. Featuring at Milwaukee Irish Fest (Aug. 2013) and at a New York book tour (March 2014), Derek is set to cross the pond and headline once again in this years Wisconsin’s Milwaukee Irish Fest. They have recently launched their first coloring book ‘Memories of Ireland’, with many more whimsical adventures and coloring books due to be published this year. Oisín the Brave’s book series is based on mythical but modern day characters and their imaginative adventures through the Dolmen of Time. Oisín is also on Twitter @eireskids and all of these wonderful books and specialty gifts are available online on the Éire’s Kids website. Great news! We’re going to have five lucky winners in this week’s giveaway. Here are the prizes just waiting to be one. Prize #4: ‘MEMORIES OF IRELAND’ Coloring Book with crayons. Five lucky winners will receive one of the prizes outlined above..
To enter just leave a comment on this blog post by noon on Saturday, March 14th, 2015. Any comment will do but if you need inspiration why not tell us about which legendary Irish character you most admire. Perhaps it’s Fionn MacCumhaill, Cúchulainn, or St. Brendan the Navigator. There’s a vast array of characters just waiting for you to pick. A winning comment will be chosen randomly. Remember to leave your e-mail so that I can contact you should you win. Your e-mail won’t be published or shared, just used to contact our lucky contestants. Winners will be announced on Saturday March 14th, so Michelle can get the winners’ prizes in the mail. Thanks to everyone who joined in and enter this little giveaway. Congratulations to our five lucky winners. 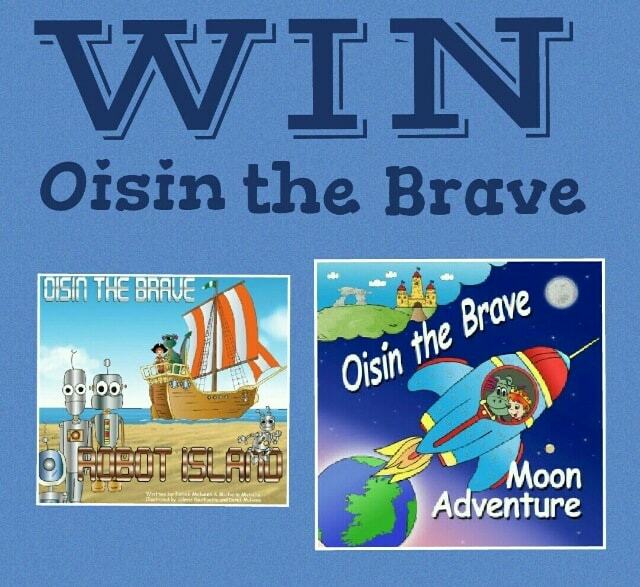 Prize #1:’OISÍN THE BRAVE – ROBOT ISLAND & MOON ADVENTURE’ Story Books go to Heather. 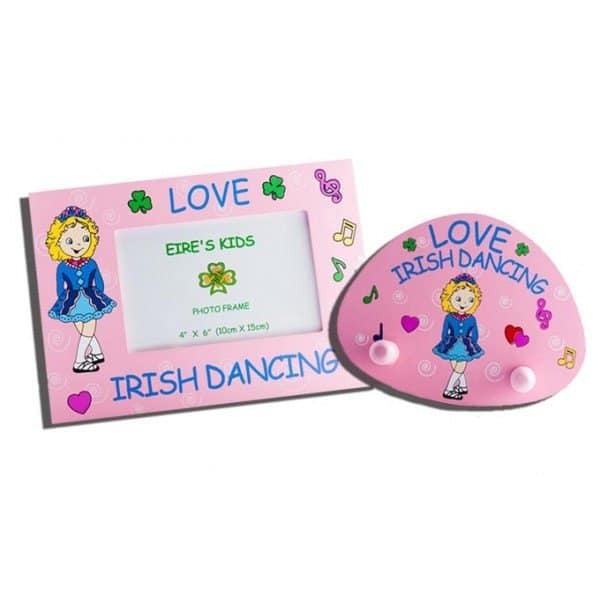 Prize #2: Love Irish Dancing Photo Frame and Clothes Hook go to Laura. Prize #3: ‘Happy St. Patrick’s Day’ Photo Frame goes to Megan. Prize #4: ‘MEMORIES OF IRELAND’ Coloring Book and crayons go to Courtney. 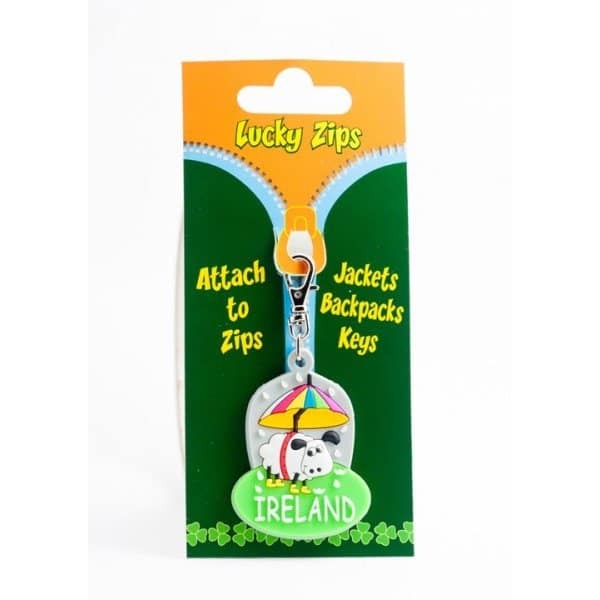 Prize #5: LUCKY ZIP – Sheep zipper attachment goes to Mary J. And a big thank you to Eire’s Kids for sponsoring this wonderful prize. Wishing them every success with their wonderful business. Disclosure: Irish American Mom does not have a business relationship with Éire’s Kids. No cash payment was received for publishing this giveaway post. I love to help spread the word about small home businesses, artists and crafts people. Thank you to all who support these wonderful Irish and Irish American business enterprises. Images published with permission of Éire’s Kids.